This study used the quantitative approach to ascertain how the concept of nurse empowerment has been used to foster effectiveness Mater Miscoridie Hospital. According to the findings, the Empowerment dimensions at Mater Hospital are not sufficient and the Mechanisms of Nurse Empowerment at Mater Hospital are not implemented appropriately. The study indicated that the empowering nurses increase the performance of nurses. Hypothesis one which states that that the hindrances of nurse empowerment at Mater Hospital can be eradicated by the management is true is true according to the findings of the study. The study indicates that Hypothesis two which states that the involvement of nurses in the organizational activities empowers them to give the best to the healthcare organization is true in the context of Mater Miscoridie Hospital. Furthermore, Hypothesis three which states that the empowerment of nurses increases the efficiency of a healthcare organization is true according to the findings of the study. The study indicates that an environment full of trust can be created by transparency and keep promises made to employees during their performance. Employee involvement in decision making on matters pertaining their tasks and departments enhances competence in their performance. Furthermore, the findings showed that the involvement instills in the employee the feeling of ownership of the organization which encourages improvement in performance and production of employees. It is recommended that the managers at Mater Hospital should be prompt in giving the workers the feedback of their performance so that they rectify their mistakes and improve their performance. Through the feedbacks, communication within the organization is complete and the management identifies the workers weak fields and lays emphasis on them during training and correction sessions. During the process, the management can gather the reactions of the employees on their performance and they can guide them accordingly and the move improves productivity in the organization. The health sector is very significant in an economy because it caters for the wellbeing of the populations. The sector employs a large number of people across the globes and they are all required to carry out their duties with due diligence and care because the medical profession requires selfless individuals. Specifically, the nurses are expected to deliver high-quality services that improve the recovery of the patients. The nurses ought to focus on reviving their patients in the best possible way. Nevertheless, the nursing profession may not be simple as it seems because there are problems and issues that face nurses in the course of their duties. The major challenge that nurses face is "Change". The nursing environment is very dynamic; hence, the nurses are expected to adapt to the changes that affect their profession in a bid to satisfy the stakeholders' and patients' needs. However, there are cases whereby nurses cannot incorporate the changes into their jobs because they are powerless. The lack of power to influence their working conditions makes nurses discontent with their jobs (Fernandez and Moldogaziev 2013). In addition to that, even in health care organizations where nurses have powers that must obtain permission before making decisions that relate to the treatment of patients. Accordingly, there are delays in making the final decisions, and this deteriorates the nurses' effectiveness. In addition to that, the patients end up suffering as a result of the ineffectiveness. The middle management in the healthcare sector is made up of nursing officials and other nursing staff who help in creating awareness among core workers. The guide them on the critical care issues that should not be ignored in the healthcare setting. Therefore, the top managers in the healthcare setting play an instrumental role in the managers (Wong and Laschinger 2013). Therefore, it is crucial for nurses to be empowered because it plays an instrumental role in meeting the needs of the patients. The empowerment of nurses gives them the authority to make autonomous decisions and this can take the healthcare sector a notch high. In the same way, empowerment implies that the nurses do not have to seek permission from their superiors. If nurses are empowered they can apply self-judgment to offer effective care to the patients in good time. The structural theory of empowerment explains that power empowers employees and it helps in maximizing an organization’s effectiveness and success. The theory shows that the behaviors of employees depend on the conditions and situations that are at the working place. According to the theory, there are four structural conditions that play a role in the empowerment of the employees and they include opportunities for advancement, access to job responsibilities, accessing organizational information and access to resources. The working environment influences the empowerment of the employees and determines the extent to which the structural conditions mentioned above are utilized. The context and characteristic of a job determine the behavior of employees and the chances of success at the workplace. When the employees' behavior is effective, the output of the organization improves a great deal. In other words, effective structures at the workplace empower the employees to give their best. The strategies help in empowering the employees to include meaningful organizational goals, involving the employees in the decision making processed, job enrichment, reduced bureaucracy and participative management. The nurses' perception of empowerment depends on the conditions of the work environment, support for the nurses, and accessibility of resources (Martin, Liao and Campbell 2013). Markedly, psychological experience influences the attitudes that employees have towards empowerment. Empowerment motivates the workers by promoting their personal efficacy. Psychological empowerment is a kind of motivational construct which manifest how the cognitions are shaped by the conditions in the working environment. Meaning that nurses derive at their places of work depend on the values, beliefs, requirements and the behaviors at their workplaces. Competence instills confidence in the workers because it gives them the ability to carry out their jobs with efficiency. Impact refers to the ability that nurses have to influence the outcomes of their jobs. Furthermore, self-determination increases the autonomy of workers because it enables them to control their jobs (Men and Stacks, 2013). The psychological empowerment process commences with the interaction between the personality of workers and the working environment. The interaction shapes the empowerment cognitions and this motivates the individual to behave in a particular way. Accordingly, the psychological empowerment process provides active orientation to work and this ends up shaping the work role and context of an individual. Interest in the topic of empowerment emerged after visiting Mater University Hospital. The nurses at the hospital are not allowed to make autonomous decisions and these delay the process of making decisions at the hospital. As such, the quality of the healthcare services that are offered to the patients at the hospital is low. The Management of Mater Hospital has not implemented sufficient measures to motivate the nurses there thus most of them are not content with working for the healthcare organization (Fernandez and Moldogaziev 2012).The situation at the Mater University Hospital relates to the Human Resource concept of empowerment. Evidently, the nurses at Mater University Hospital are not empowerment sufficiently and this has impacted the quality of healthcare that is provided there. This study will assess how the effectiveness can be enhanced in the healthcare setting through empowerment. First and foremost, the study focused on the Nurses at Mater Hospital thus the results will not reflect the views of nurses from other hospitals. In other words, the results will only be applicable in the context of Mater Hospital. Secondly, some nurses provided erroneous answers because they were scared that the management would reprimand them. Furthermore, the research was conducted within a short time thus the procedures that were used lacked understanding and clarity. Finally, there was a shortage of funds to conduct the research hence the accessibility of additional information was limited. According to the current and previous literature on empowerment of nurses, the health care organizations are faced with the challenge of empowering nurses due to environmental, organizational, financial, structural and behavioural barriers. The literature indicates that the regulations and laws that govern the empowerment of nurses are not sufficient and the top managements in most healthcare organizations do not support the empowerment of nurses. Furthermore, the top managements do not trust the decisions that are made by nurses thus they deny them autonomy. The existing literature on nurse empowerment focuses on the general strategies that can be used to empower the nurses. There is no much literature on the strategies that are relevant to the Mater Hospital specifically. In other words, there are no studies that have been conducted on the nurses at Mater Hospital yet it is a very big hospital. The study will bridge the gap by focusing on how empowerment impacts on the nurses that work at Matter hospital. Practically, the concept of nurse empowerment is significant because it influences the manner in which the nurses handle the patients that are placed in their care. The empowerment of nurses has both short term and long term effects. Regarding the short term effects the nurses get excited and their commitment and loyalty go a notch high. In reference to long-term effects, empowerment increases the quality of healthcare services that are delivered to the patients and it fosters a positive working environment. More importantly, it increases the competence of nurses because it offers them the opportunity to make autonomous decisions. Based on the long-term implications of employee empowerment, this study investigated how empowerment can be sued to enhance the effectiveness of Mater Hospital. The findings of the study will enlighten the senior management at Mater Hospital how to empower the nurses in a bid to enhance their overall performance. Furthermore, the study will give recommendations on the how Mater Hospital should empower the nurses. The structure of the dissertation is summarized in figure one below. The concept of empowerment envisions the aspects of task enlargement and task enrichment. Task enlargement entails the widening the employees’ scope of operation whereby they are responsible for many tasks related to their initial ones. Task enrichment refers to the process that involves deepening the level of the tasks by increasing the number of responsibilities possessed by an ordinary employee. According to Zhang and Zhou (2014), the concept of employee empowerment instills the employees with the democratic feeling which encourages them to be vigilant in participation and productive in their activities. Also, employee empowerment calls for the employees and the management team to delegate some roles to the other employees. Delegation is not done blindly because the managers are further made to assume new roles such as the monitoring and supervision role over the employees. Empowerment gives the managers and employees an opportunity to know the level of performance and expertise of all the individuals. The knowledge is used by the managers when redistributing the activities because each employee is assigned according to their performance and this leads to organizational success. As noted by Wang, Gan and Wu (2016) the empowerment concept holds that the employees are held responsible and accountable for their actions. Therefore, the employees reach upon various decisions knowing that they are answerable to their top counterparts and this encourages them to act professionally alongside making informed viable decisions. Fernandez and Moldogaziev (2013) explain that the success of a company greatly depends on the employees and employers strive by all means to make them comfortable to perform well. The act of employers to create an enabling environment for the employees for efficient performance is referred to as empowerment. Employee empowerment can also be seen as the managements approach in redistributing its power and authority to the subordinates to perform various duties within the companies. Wong and Laschinger (2013) note that empowerment entails that employees are considered in the decision-making process and motivated in different ways. Employees can be empowered in different ways which include the following; subjection of the employees to the control of the activities of the organization, compensation based on the level of their performance, training them on their duties and feeding them with important information about the company. Martin, Liao and Campbell (2013) assert that empowerment includes the aspect of employer trusting the employees fully. The results of the unlimited trust may be negative or positive to the two parties. For instance, if the employer gives the employee too much trust, the employee may either take advantage of the situation by making unviable decisions that favor them or take the control of the company from the management. These actions may lead to the negative performance of the company hence lead to successful losses. The employees can also be more active and productive when the employers show trust and confidence in them. Men and Stacks (2013) note that the process of employee empowerment involves many stages which include the following; firstly, the employees should be enlightened about empowerment and its importance. Secondly, the management should take the initiative to inform the employees of the company’s vision and mission. The knowledge enables the employees to work towards the same direction and once they embrace them, the performance improves. In stating and implementing the company’s mission, the management should embrace all types of communication to and from the employees such as, through emails and other. Fernandez and Moldogaziev (2012) explain that the employees are trained on ways to achieve the set objectives. They are also filled with the knowledge of how to handle other tasks and responsibilities. Fourthly, the structure of the company is altered to fit the requirements of the management team. Fifthly, the management leads the employees in the planning, promoting, rewarding and hiring in the employee empowerment process. Finally, the management team implements and makes various changes after performance appraisal which includes assessment and giving feedback to the employees. Gill, Sharma, Mathur and Bhutani (2012) assert that suggestion involvement level refers to when the employees are allowed to point out their opinion on how the company is run and any positive changes that they prefer. The employees are also allowed to pinpoint the activities and programs that cause negativity in the company. These activities can be done with an open face to face discussion or privately writing down their thoughts on pieces of papers and dropping them in the suggestion boxes. The management then goes through the opinions and after discussion with the employees; they take corrective measures to improve the performance. As noted by Fock, Hui, Au, and Bond (2012) at the work involvement level the employees assess their responsibilities and seek for ways to improve their performance. The core decision-making process is left to the leaders who communicate the final decisions to the employees. The employees are not given the authority to make higher decisions but they are given the opportunity to amend the ways they carry out their tasks. The employees receive prompt feedback from their leaders and clients after which they act accordingly to improve on their labor skills. Raub and Robert (2013) explain that the high involvement level focuses on the lowest subordinate employees by involving them in active participation in the activities of the organization. The employees are further developed into self-managed teams that take part in decision-making tasks. The participation instills in them a sense of ownership and belonging to the organization. According to Ugwu, Onyishi, and Rodríguez-Sánchez (2014) in this strategy, the management teams study the business norms and rules and analyzes them carefully. Once they understand them, they set the attainable aims and goals of the business based on the mission and vision statements. The goals and objectives set are directed to the satisfaction of both the employees and their clients. Hassan, Mahsud, Yukl and Prussia (2013) explain that the employees should be encouraged to create a positive relationship with their clients to build their loyalty to the organization. The good relationship can have resulted by empowering the employees through the satisfaction of their needs because satisfied employees offer satisfying services to the clients. Since the services of the organization are directed to the final consumers, the employees should be sensitized that their jobs highly depend on the treatment of the clients. Therefore, they should strive to retain the existing clients and continuously welcome the new ones. Since customer satisfaction goes hand in hand with employee satisfaction, the employers should strive to establish a conducive environment for the employees and show them how valuable they are to the organization. These actions create trust and confidence of the employees who make the satisfied as they perform their tasks. The satisfaction encourages friendly relationships with the clients that result in increased productivity and improved performance. According to Sun, Zhang, Qi and Chen (2012), in any workplace, there are both permanent and temporary employees. The permanent employees work on a long term basis while the temporary employees are hired on the short term basis. In the empowerment of these employees, different approaches are used to satisfy them and to enhance positive performance and productivity. For instance, the permanent employees may be empowered to work well by the management's motivation factors like the promotion of the hardworking employees and the short-term employees may be motivated to work well and be absorbed as permanent ones. Therefore, during the empowerment process, the managers should consider both the short term and long term employees by incorporating the empowerment aspects that favor both of them. Dahinten et al. (2014) note that legitimate empowerment is obtained from the post that a worker holds in the company. Normally, the leaders possess this form of empowerment and they frequently ask their subordinates to carry out some tasks without objection. Their positions allow them to instruct the other employees and the employees carry out the instructions as required. According to Daily, Bishop, and Massoud (2012), employees are motivated by the rewards they receive after performing their duties correctly. The types of rewards range from tangible monetary rewards to intangible recognition rewards depending on the employee's demands. The management and employers can also reward the hardworking and innovative employee by promoting him or her to a higher level. Acknowledgment of an employee for good performance challenges his or her colleagues to improve their performance to be rewarded. Bagheri et al. (2015) explain that coercive empowerment entails the disciplinary measures taken against the employees who do not embrace empowerment. The disciplinary actions put in place include the following; reduction in salary, demotions, allocation of unwanted tasks in the company. These measures discourage the employees from acting otherwise because they end up losing the expected privileges. Therefore, the employees are forced to admit the empowerment process. As noted by Manzoor (2012) the word empowerment is derived from the word ‘power' and power can be described as the ability to influence the actions of other individuals. From the employees' point of view, power is seen as the control that the employees are endowed with in the running of the organization. From the management point of view, power refers to the extent to which the managers control the activities of the organization. Therefore, employee empowerment refers to the process by which the management team passes power to the employees by activities such as, allowing them to participate in decision-making. Power can be obtained through different ways like; through the position one holds, through the amount of money one possesses and through the knowledge or expertise of an individual. According to Biswas and Bhatnagar (2013), this type of power is normally exercised by high-ranking officials in the organization like the managers and the directors. The amount of power exercised by individuals is determined by rank in the leadership hierarchy of the organization. Therefore, it is evident that, the higher the rank of a person in the organization's leadership hierarchy, the higher the amount of influence of the individual in the organization and vice versa. Since the managers are deemed powerful in this case, their role is to instruct and order the other employees while the employees' duties are to carry out the instructions and to respond to the management orders without fail. Furthermore, the decision-making process is centralized to the top managers who communicate the final decisions to the subordinates. This type of power applies well in situations where immediate response is required and in the presence of unavoidable crisis in the organization. Laschinger, Wong and Grau (2013) explain that this type of power is drawn from the level of expertise possessed by an individual. Whenever a person shows consistency in his or her expertise, the other employees view him as a lead to success and this bestows in him a high level of influence on the employees. Because from past experience the employee are positive about him/her, they end up trusting him/her completely and this leads to the other employees copying from his /her actions. The presence of such people in the management team is a good base for employee empowerment in the organization because knowledge is an empowering tool to the employees. Lorinkova, Pearsall and Sims (2013) note that the amount of money one possesses determines his/her influence on other people. For instance, in the organization, the managers need to be well endowed with necessary resources at all times for better performance. At times, when the resources are not available due to limited funds, the manager is left with the alternative to empower the employees by providing them using his own means to be compensated later. Thus, it is prevalent that the higher the amount of money one has, the higher the chances of being selected to the management team and vice versa. Money is the influencing factor in this case. Lorinkova, Pearsall and Sims (2013) note that it is beneficial for a company to adopt the knowledge based power system because the sharing of the knowledge is part of employee empowerment. Also, the money based power is important because it enhances smooth running of operations in the organization hence encouraging the employees to perform better. The management team should limit the coercive type of empowerment and instead embrace the democratic form of empowerment which encourages employee participation. Kim, Sutton and Gong (2013) explain that impact refers to the amount of influence an employee has in improving or decreasing the performance of an organization. To empower the workers, the management has to ensure that the employee's mind is filled with the idea that they are the backbone of the organization and they determine its performance. The management should also make the crucial information accessible to the employees to enable them to use it positively for the betterment of the organization. Ultimately, the influence of the employees of the organization is determined by the treatment from the employees and top management. The more transparent the employers are the greater the employees positive impact on the organization and vice versa. As noted by Kim, Losekoot and Milne (2013) competence refers to the ability of the employees to skillfully and confidently carry out various duties and responsibilities. Managerial contact and guidance to the employees encourage the employees to trust in themselves and improve their confidence in their performance. Employees' competence can be further implemented by prompt feedback about their performance from the assessors. The feedbacks encourage the employees to take required corrective measures to increase their competency. Employers should also create a friendly and cool atmosphere to enable the employees to think about how to improve their performance. According to Hong et al. (2012) meaningfulness refers to the personal value of a task to the employee carrying it out. For the task to be well performed, the employees must first attach great value to the activity. The value attachment can be achieved by the manager's attitude on the transparency of the important information of the company. In cases where managers withhold the core information like the goals and objectives of the company, the employees consider their activities less important in the company and this leads to poor performance. Where employers and managers are open about their plans to the employees, there is improved performance because employees consider their activities valuable in achieving the set goals and objectives. Additionally, to elevate the meaningfulness in the employees' activities, close monitoring is prudent as it keeps the employees' activities in check. Bysted (2013) explains that choice refers to the employees' independent act of selecting their suitable ways to perform their tasks in the organizations. Whenever the employees are left to independently make the decisions affecting their performance, they tend to perform better because they feel valued. The democratic act of the managers to the employees empowers them to get even to higher grounds because it allows them to be innovative without any limiting factors. It also enhances the employees' positivity because the employees can recognize how their actions affect the running of the organization positively. The positivity instills confidence in the employees and this improves the performance of the entire organization. Laschinger et al. (2012) note that leadership refers to the way people are directed by others with the aim of achieving a common goal or objective and it entails the relationship between the leaders and the employees. According to McGregor's Theory X, the supervisors have a negative attitude towards the employees. They are filled with the thoughts of employees are only interested in the monetary value of their work and not the overall productivity of the firm and hence they are considered selfish. Therefore, to enhance effective performance in the organization, the directors and managers adopt the coercive system of empowerment. Laschinger et al. (2012) assert that Theory Y is a contrast to theory X because, in Y, the managers and supervisors have a positive attitude to the employees. The management teams in Theory Y view the employees as individuals who are ready to offer their best as long as the managers provide the necessary resource. Here the managers are the stepping stones to employee empowerment in the organization while in theory X; they are the stumbling blocks which are against employee empowerment. However, the presence of Theory Y type of managers is not enough without appropriate empowerment actions. Yang et al. (2014) assert that under theory Z, the managers go an extra mile by putting aside their leadership roles by acting as coaches and distributing power and responsibility to the employees. These actions go beyond holding the assumptions that employees are good performers without literal prove. The type of leadership style applied determines the success or failure of the employee empowerment process. Markedly, to achieve success, managers and directors should choose to work as described by theory E, which calls for their actions. As noted by Cicolini, Comparcini and Simonetti (2014) in the corporate structures the management team is located high in the structure. Also during communication and providing of the services, the managers do not interact directly with the final consumers. Considering the fact that the employees are the bridge between the top management and the owners to the final consumers, there is need to empower them with skills to handle the final consumers. The management team delegates the responsibility of the control of the clients to the employees. Cicolini, Comparcini and Simonetti (2014) add that the managers can achieve this by removing the barriers that deter employees from accessing important information, training the employees on how to handle their tasks and developing an enabling environment that ensures the provision of good services to the clients. These activities automatically lead to the smooth running of the organization and increased efficiency and effectiveness in the employees' performance. In summary, the corporations should adopt the decentralized form of corporate structure which holds that the general organizational control and decision making is spread to all levels of the organization. According to Harris et al. (2014) the cultural environment in which the organization operates determines the success or failure of the employee empowerment program. The way a manager handles the failure of an employee in the organization determines the type of relationship that ensues after the incident. If a manager handles failure positively by correcting and guiding the employee without blame, a good relationship and an environment of trust develop. Harriset al. (2014) assert that if the manager handles failure by hauling insults and blames on the employee, a negative relationship and environment of fear of fear develop. The environment of trust encourages the employee to keep trying to perfect performance and this leads to competence and expertise in the organization. However, in an environment of fear, the employee avoids trying due to fear of failure and the consequences associated with failure. Therefore, for empowerment to be successful in the organization, the managers should lower themselves to act as coaches and mentors to employees rather than negative critics. They should encourage the employees to use failure as an opportunity to learn more and success as an achievement and a reason to always work smart. The managers' attitudes encourage the employees to make more mistakes to enable them to learn many tactics of handling them in future. In this way, the climate of trust turns failure into stepping stones and success to building blocks. Bhatnagar (2012) points out that honesty refers to the truthfulness of the employees dealings within the organization. During their performance, the employees are either expected to be successful or to fail. The fact that the managers expect either of the two results too should encourage them to be honest and not to hide the truth even if it means failure. Once failure is reported by an employee, its root causes are identified and eradicated in due time. The readiness to receive a positive or negative but honest criticism empowers the employees to learn from the current mistakes which in the end increase their self-efficacy. As noted by Joo and Lim (2013) managers can encourage employees to actively participate in the company's decision-making, and this enables them to voice their opinions from which the viable ideas are selected. Employees are empowered through participating in their tasks or through other activities like executing organizational control beyond their activities. Ebers and Maurer (2014) emphasize that the employees are empowered through working in self-managed teams because through their interactions with the other team members, they satisfy their social needs and this leads to improved productivity. Additionally, the work groups act as tools for control because the members monitor the actions of their colleagues and this result to responsibility on the part of the members. Ebers and Maurer (2014) add that employees can also be empowered individually to perform well in the process of job enrichment. Job enrichment involves the actions of employees to take part in other activities that are directed towards the satisfaction of their clients apart from just performing their normal tasks. These actions include; the collection of complaints from dissatisfied clients, analyzing and giving prompt feedbacks on counteractive measures on the complaints to the clients. As noted by Yang et al. (2013) note that this type of empowerment involves the manager's actions that are directed towards increasing the satisfaction of employees through other means other than their tasks. The empowerment can be in the form of representation of employees in organizational decision-making panels. Selection of some employees to represent all the other employees in voicing their common interests is made to make them feel part of the organization. The sense of identity enhances the mutual and emotional satisfaction of the employees which encourages employee effectiveness in their organization. The representation in the panel also enhances employee independence in voicing their opinions and suggestions through their representatives. Therefore, the democratic feeling encourages the employees to introduce new innovative ways to the organization without fear of failure and this increases the employees' confidence and commitment. According to van Dijke et al. (2012) employers and managers encourage the employees to take part in the implementation of programs and services offered by the organization. Despite the employees' involvement, they are not allowed to make final decisions because the managers, directors and owners are considered final. The managers obtain the employees' pieces of advice by incorporating quality circles and group seminars which push employees to exploit their potentials in serving the clients and giving their opinions on how to handle various problems. In the end, these views are analyzed and the best are applied in the organizations hence leading to improved organizational services which result in consumer satisfaction. Quality circles also improve the communication between the employees and their supervisors. As noted by van Dijke et al. (2012) apart from the positive empowerment effects of the quality cycles, they also possess negative effects on the employees. For instance, the quality circles comprise of a few employees and as much as they are empowered; therefore, not all employees in the organization are empowered. Also, quality circles create strained relationships between the involved and uninvolved employees which lead to poor production in the organization. Since the uninvolved employees are more than the involved ones, they may affect the overall production negatively because of their negative actions. Employers can also empower the employees by regularly holding seminars for all employees to discuss the company's goals, objectives and how to improve them. These seminars play an important role in disseminating information about the organization to the employees. The seminars also serve as platforms to guide and correct the employees in their performance. Shapira-Lishchinsky and Tsemach (2014) posit that this form of empowerment calls for the management teams’ actions pointed towards increasing the employees’ anxiety to perform and offer quality services to the consumers. Employee commitment can be divided into calculative and non- calculative commitment. In calculative commitment, the employees value the benefits of working in the organization more than the benefits of their absence in the company. The important aspects accrued to the employees for working in an organization include; monetary value, promotions and personal development. The employees in the calculative commitment weigh between the organizational benefits and the costs associated with not working in the organization and then they embrace the benefits in the end. Shapira-Lishchinsky and Tsemach (2014) claim that employees with noncalculative commitment view the company's value to them from the psychological point of view. In this case, the employees are emotionally connected to the company end; hence, they enjoy working in it. The psychological bond acquired by the employees during their performance in the company empowers them to act as if the company belongs to them and thus their actions results in improved production in the company. According to Katila and Eriksson (2013), noncumulative commitment is achieved through the recognition of the employee's value in the running of the organization. Since employees feel worthy to work in the organization, they perform well because they are inspired by their positive feelings to work smart. Commitment enables the employees to strive to stay within the company and this reduces the rate of staffing which enhances the company to empower the reduced number of employees through training. Since the reduced number of employees incurs reduced costs in the empowerment process, the committed employees remain acquainted to serve the clients diligently and hence lead to improved production in the organization. Cheung, Baum and Wong (2012) claim that there are many layers in the organizational structure because of the presence of many responsibilities carried out by different officers in the hierarchy of the organizational structure. To reduce the number of individuals and positions in the structure, some of the positions are removed by training the subordinates to carry out the responsibilities of the middle managers. The process of reducing the size of the organizational structure is referred to as de-layering and it is done by reduction of the number of employees and increasing their regular amount of tasks. De-layering aims at increasing the contact between the top management and the consumers to identify easily and act upon their constantly changing tastes. Decentralization also improves communication within all levels of the organization because they are closer to each other as compared to there before the restructuring. As noted by Sun et al. (2012) the managers are relieved some tasks like decision-making and organizational control by the empowered subordinates which enable the management to concentrate on concrete ideas in the organization. Apart from the advantages of de-layering, there are also disadvantages to the employees. For instance, the subordinates are trained to carry out other tasks and this de-motivates them from performing well since promotions are limited. Also, the top managers view empowerment through decentralization as a move that increases their roles without an equal increase in their pay and this de-motivates them too. The managers should first empower themselves either by individual means or through joining autonomous work teams to enable them to gain the ability to empower the other employees. Frazier and Fainshmidt (2012) argue that in most occasions, empowerment is viewed to be the same as motivation but these two aspects are only related to each other but not the same. Employee empowerment leads to employee motivation in the organizations which results in good performance and increased productivity. Employee motivation can be said to be the willingness of the employees to perform their tasks with the aim of achieving organizational aims and objectives. Frazier and Fainshmidt (2012) add that different employees are motivated by different motivating factors and it is difficult for them to be moved by the external aspects like the director's actions. Empowerment entails meeting the employees' internal dimensions which include; impact, meaningfulness, competence and self-determination of the employees. The following theories explain the difference between empowerment and motivation in organizations. According to Wilkinson, Dundon and Marchington (2013), Frederick Herzberg came up with the two-factor theory which holds that the effect of meeting the employees needs can either cause satisfaction or prevent dissatisfaction. Furthermore, he differentiated the satisfiers from the factors that prevent dissatisfaction by calling them motivators and referring the factors preventing satisfaction as hygiene factors. Examples of hygiene factors are; salary, company's objectives and the relationship of the employees and the management. Once these factors are made positive, they reduce job dissatisfaction but on the contrary even if they are met; they do not lead to job satisfaction. Wilkinson, Dundon and Marchington (2013) argue that motivators like self-development, recognition, advancement and responsibility help in causing satisfaction on the employees. However if not fulfilled, the motivators do not cause job dissatisfaction on the employees but rather results to unsatisfied employees. Various conditions are applied to attain employee motivation in the working environment. Yidong and Xinxin (2013) state that the tasks performed should be designed to suit the employees’ requirements appropriately and before engaging in them, they should be appropriately trained and guided. Promoting employees that perform better than others enables them to learn about other tasks and to be responsible for their performance. The leaders should criticize the employees both negatively and positively based on their performance to encourage them to correct their mistakes or encourage you to keep performing well. Yidong and Xinxin (2013) explain that the management and the supervisors should be the stepping stone for the employees’ personal growth and expertise by availing them with a wide base for their knowledge and expertise. Fifthly, various tasks should be delegated to the employees and after proper guidance, the management should ensure that the perform them to meet the expectations of their organizational needs and the clients. Finally, both the supervisors and the employees should take part in coming up with the companies’ objectives and goals after which the employees work towards achieving them. The supervisors should be prompt in giving the employees the feedback on their performance and guide them in their corrections. The feedback serves as the measuring grid for the employees’ performance because it indicates their degree of performance. North, Bergstermann and Hardwig (2016) argue that provision of a motivating and conducive environment enhances improved production in the company. It can be concluded that employee empowerment is the basic factor that leads to employee motivation in the company. Therefore, before any form of motivation is subjected to the employees, they should first go through the complete empowerment process which automatically leads to the final motivation. Laschinger et al. (2014) state that the Hawthorne effect holds that the performance of the employees is determined by the behavior of all the employees as a group. Apart from money as a motivating factor, the interaction of the co-workers and other colleagues with the working environment contributes to the satisfaction of the employees' social needs. Therefore, managers motivate the workers by meeting their intrinsic needs by creating various groups that influence the workers to perform well in their tasks. Laschinger et al. (2014) note that through the groups, the employees can interact within themselves and are easily coerced by their group members to do their best. Instead of exercising much power and authority on employees, the managers and directors should direct their efforts to listen and to interact with the employees to understand their difficulties in the performance of their tasks. Since the empowerment aspect emphasizes on group work the same way as the Hawthorne theory, it is concluded that empowerment can be used in motivating workers to perform well. Ou et al. (2014) explain that the expectancy theory is based on three aspects which are; employees efforts in their tasks, their level of performance and the final outcomes of their tasks. These aspects are interrelated to each other in that; the level of effort in performance determines the quality of the final product or service to the consumer. Therefore, it is assumed that the higher some employees' efforts in performance, the higher the quality of the final products and services to the clients and vice versa. Expectancy theory is also based on the assumption that the employees' productivity and performance are based on material needs like the monetary value of their compensation. For instance, increased amount of wages and salaries for smart and hardworking employees encourages them to double their effort to receive good salaries. Ou et al. (2014) emphasize that the behavior of employees is determined by the rewards they expect and this affects the organization's production. If the employees expect promotions at the end of a certain work period, their performance is motivated by their expectations because they tend to perform well to be promoted. The positive expectations lead to improved performance and increased production in the organization. According to Conger and Kanungo's model, self-efficacy expectations are similar to the employees' expectations in the expectancy theory. Therefore, it is evident that once employees are empowered, the motivation aspect automatically comes in. Similarly, Thomas and Velthouse model argues that the satisfaction of the four basic intrinsic factor leads to the motivation of employees to perform well. As noted by Ma et al. (2013) job enrichment refers to the process of redesigning jobs in ways that employees are entitled to much control over their tasks. Job enrichment also encompasses the process of widening the array of tasks that employees handle to improve the productivity of the organization. Furthermore, enrichment encourages the employees to engage in challenging activities which enhance them to increase their effectiveness. The job redesigning, increased employee control and risk taking among the employees are the aspects emphasized by the empowerment theory. Ma et al. (2013) note that as the management team engages in redesigning the tasks, they also engage the employees in different training sessions and this increases their self-efficacy which leads to positivity in production and performance. Since the employees are endowed with control in their activities, they feel a great sense of ownership and this motivates them to perform well. Finally, the fact that the employees are given the freedom to make risky but viable decisions, they are exposed to different situations during the process and this leads to gaining much experience which results in positive productivity. Therefore, job enrichment can be said to be a form of empowerment, which initiates motivation on the employees. According to Buvinic, Furst-Nichols and Pryor (2013) empowerment can result in both the negative and positive consequences to either the employers or the employees. The positive consequences include the following; firstly, employee empowerment results to high levels of employee morale and productivity. Once the employees are made to feel valued and trusted, they implement the innovative ways to handle various tasks in the company successfully. Since the employees do not rely on the approval of the top managers, the production process is fastened and this leads to a smooth workflow. The trust received from the management team boosts their morale and productivity. Through the empowerment, the employees are made more responsible and they focus on the provision of quality products and services. Buvinic, Furst-Nichols and Pryor (2013) state that before performing their tasks, the employees are trained and filled with relevant information to handle them. Given that information is power, the employees stop at nothing other than quality goods and services. Moreover, when the employees are made to feel that they have part of the ownership in the company, they tend to handle risky processes that result to the provision of good quality products and services. Ackfeldt and Malhotra (2013) claim that the empowerment process improves the rate of the decision-making process and the quality of decisions reached upon. The fact that employees' opinions are gathered and considered leads to a collection of better ideas that management does not possess. The process of consultation between the employees and the employers improves the quality of decisions made. Ackfeldt and Malhotra (2013) add that employee participation and involvement leads to reduced management stress and increased employee commitment. The fact that the managers pass some roles to their subordinates release them from the many tasks that need their attention and this gives them more demanding organizational activities. Employee empowerment leads to employee satisfaction which in turn changes the way the employees view their clients. Satisfied employees handle the clients to satisfaction and this leads to progress in the company as the clients maintain a good relationship with their service providers. Finally, empowerment fills the employees with entrepreneurial risk-taking minds which push them to engage in potentially risky but profitable projects. Once the projects are successful, the company becomes successful too. Bogler and Nir (2012) explain that during the initial delegation of jobs, the employees may be deemed ignorant in their new jobs which result in poor performance. Lack of expertise leads to increased mistakes in the whole line of operation which results in overall poor performance. Additionally in an unstable work environment, employee empowerment serves to destroy rather than to build due to lack of guidelines and objectives of the organization. In situations where the employees are left to democratically make their work decisions without supervision, things tend to go astray because each operates within his/her set rules. Bogler and Nir (2012) explain that the employees’ freedom to take part in overseeing the company’s activities threatens the job security of the management team. The employees assume the leadership roles meant for the management hence rendering the management team unnecessary. Once the employers realize that the employees can manage themselves without the managers, they may finally end up sacking them. Furthermore, the employees misuse the freedom by inciting each other to get into unnecessary strikes and demonstrations which cause a lot of damage to the organization. According to Aryee et al. (2012), the empowerment can lead to misuse of crucial information by the employees since empowerment calls for transparency; the managers are forced to share all the details of the company to all the employees. Therefore, the secrets of the company are exposed and they can be used by the competitors to outsmart the company. Considering the fact that not all employees are well-intentioned, some of them can use the information for insider trading without any hindrance. Finally, employee empowerment affects the relationship between the management and the other employees. Because the employees are bestowed with authority in the companies, they consider themselves equal to the management team and this action results to breaking of the boundaries between the directors and the employees. Whenever the organization decides on empowering the employees, it considers the positive effects because the negative ones can be easily controlled by proper training, proper communication and good leadership styles and techniques. Therefore, it is prevalent for the management to thoroughly prepare for the empowerment beforehand. Frazier and Fainshmidt (2012) explain that team empowerment refers to the subjection of authority to groups of individuals in the organization. Apart from working as individuals, there are some tasks in the workplaces that require coordination among the employees and it calls for group work. Since the efficient performance of the teams leads to success in the organization, there is a need for the management team to empower them. Team empowerment can be defined using four dimensions which include; potency, meaningfulness, impact and autonomy. Potency refers to the collectiveness of the group's effort in performing the company's operations while meaningfulness refers to the level of importance laid on the different tasks performed by the groups. Frazier and Fainshmidt (2012) add that autonomy refers to the way the work groups exercise democracy in their tasks while impact refers to the extent to which the workgroups influence the productivity of the company. The self-managing teams are said to perform their responsibilities well because they do not wait for the approval of the top management. The fact that the teams are collections of many individuals strengthens their decisions because different opinions and ideas are shared before reaching the conclusions. Also, the corrective performance brought about by team empowerment reduces the burden of individual responsibility. According to Wilkinson, Dundon and Marchington (2013) there are two major organizational structures which are; the centralized organizational structure and the decentralized organizational structure. In the centralized structure, the power is concentrated on the leaders and the other employees only follow the directives while in the decentralized organizational structure; the employees are empowered to make various decisions. Structural empowerment entails that the organization adopts the decentralized organizational structure to empower its employees. Structural empowerment increases the availability of the organizational information and improves communication within the organization. It also enhances better decision making because many brains are used in the exercise. According to Yidong and Xinxin (2013), Psychological empowerment refers to the process that the management team uses to influence the brains of the workers positively to enhance positivity in the organization's production. The employees' level of satisfaction affects their level of performance. Therefore, the employers and management team take the initiative to satisfy their employees by improving their pay, recognizing their efforts and promoting them. Once the employees feel satisfied, they are psychologically happy, and this results to improved performance within the organization. Psychological empowerment can be explained by four dimensions that are; choice, impact, meaning and competence. Choice refers to the confidence that one possesses in his mind that he or she can trigger productive actions. Impact refers to the effect of the employees viewpoints on their productivity and overall performance. Meaning refers to the worth of the employee's activity based on his or her beliefs and past experiences. Finally, competence refers to the notions of the employees about their abilities to perform their duties with expertise and according to the requirements of their clients. North, Bergstermann and Hardwig (2016) argue that the major aim of employee empowerment is to increase the level of employee effectiveness in the company. Employee effectiveness refers to the ability of an employee to perform an extra number of tasks properly without incurring unnecessary extra costs. Empowering employees enable them to realize their hidden potentials and exploit them to the advantage of the company. Once the employees know their competencies, their effectiveness is improved and this leads to better performance. The relationship between employee empowerment and employee effectiveness can be described using different approaches which include; goal attainment approach, resource system approach, internal process approach and multiple constituents approach. Laschinger et al. (2014) emphasize that the goal attainment measures effectiveness based on the achievement of the set goals and objectives. Empowerment requires that the employees are fully informed about the company's objectives and goals so that they work towards achieving them. Where the employees work blindly without the information of the expected goals and aims of the company, their effectiveness is low. Therefore, to increase employee effectiveness, the leaders should inform the employees of their plans to make them feel like part of the whole team. The information will boost their morale and encourage them to work towards achieving them. Once the goals are achieved as per the desired plan, the employees are considered effective and vice versa. According to Ou et al. (2014) the system resource approach holds that the effectiveness is based on the availability of the necessary resources in the organization. Here the management team organizes the employees in such a way that they connect with suppliers to obtain the tangible resources. The management further empowers the employees with the democracy to voice their opinions during the decision-making process. The decisions made constitute the intangible resources of the organization. Ma et al. (2013) explain that during the process of empowerment, the employees are trusted by the management and this increases their willingness to offer their labor resource. Ultimately, to improve the employees’ effectiveness, there is need to improve the quality of their labor by psychologically making them feel valued. Ineffectiveness in the workplaces results from treating employees unfairly as if they are not important. Since labor is the backbone of all the other tangible resources and the output cannot be obtained without it, empowerment measures have to be taken to increase the employee effectiveness. As noted by Ma et al. (2013) the internal process approach holds that for effectiveness, the parties within the organization should be in harmony with each other and the various programs running in the organization should be aimed at achieving positive results. For harmony to be present, both downwards and upwards communication should be present. The employers and management should inform the employees of their plans and lead them towards achieving them. Without the communication, the workers will have no driving force and this will result to ineffectiveness which in turn leads to low productivity. The management team should further listen to the suggestions of the other employees about the operations within the organization. From the employees' suggestions, the management can reach upon better alternatives than the existing ones. Once the processes are implemented the employees' effectiveness improves which results in increased productivity. The multiple constituents approach holds that the effectiveness of the employees depends on a great array of activities. Therefore depending on different grounds, the employees can be deemed effective in one operation and ineffective in another. The bottom line is that the empowerment goes hand in hand with employee effectiveness. Bagheri et al. (2015) explain that the Conger and Kanungo model describes empowerment based on two aspects which are power and motivational aspect. The power aspect goes hand in hand with the structural empowerment which embraces the decentralization aspect to encourage employees to take part in the creation of the organizations resolutions. The power aspect further encourages employee participation in the control of the organization and other organization activities. The motivational aspect enhanced self-determination and capability of the employees as they perform their duties. The model is divided into five stages which include; detection of organizational aspects that lead to the notion of incapability, ways to eradicate the sense of incapability, feeding the employees with the information about capability, employees' notion of being entrusted with authority and the observable effects of the power approval. Bhatnagar (2012) asserts that the first stage entails the detection of organizational aspects that encourage the feeling of incapability among the employees. The aspects can be categorized into; leadership style, organizational factors, job design and reward systems applied. The aspects of leadership style include; high control, lack of employee involvement and negative attitude. The organizational factors include; high competition, poor communication, centralization of resources and frequent organizational changes. The aspect of job design includes the following; immeasurable goals, lack of job specification, poor or no training, limited resources, lack of employee participation and lack of appropriate technical support. The aspect of reward systems entails the following; low level of contingency, lack of innovative rewards low value of the rewards and lack of rewards based on employees competency. Biswas and Bhatnagar (2013) note that the second stage of the Conger and Kanungo model aims at getting rid of the organizational aspects identified in the first stage. These aims can be achieved by using the following strategies; job enrichment, modeling, the introduction of rewards based on the level of competency and introduction of prompt feedback mechanisms. As noted by Bysted (2013) the Thomas and Velthouse model improved the Conger and Kanungo model by introducing the aspect of intrinsic motivation in the definition of employee empowerment. The model further argues that employees may possess self-confidence but if they lack the willingness to perform the tasks, the confidence does not help in improving productivity. Thomas and Velthouse model contains four assessment components that define employee empowerment. The assessments include; impact, competence, choice and meaningfulness. Cheung, Baum and Wong (2012) posit that impact refers to the extent to which employees' characters affect their performance of activities of the organization while meaningfulness refers to the employees' judgment on the worthiness of the activities performed. Competence refers to the expertise of an employee in performing tasks and choice entails the taking responsibility an employee's actions. To achieve the task assessment program, Thomas and Velthouse came up with a model to guide them in the program. According to Cheung, Baum and Wong (2012) the model consists of the following components; environmental incidents, task assessments, psychological events, global assessments, interpretation styles and interventions. Environmental incidents aid in the development of the employees’ characters by informing them about the consequences of undesirable characters. The task assessments include impact, choice, meaningfulness and competence. These assessments are the driving forces on the performance of the employees. The task assessment programs aim at showing the progress of the productivity and performance of the employees. The psychological events consist of the level of resiliency, concentration, flexibility and initiative possessed by the employees. These characteristics determine the level and quality of employees’ task performance. For instance, an employee who is flexible in his operations tends to adapt fast to changes in the methods used in performing tasks. Therefore, it is prudent that, the higher the amount of employee flexibility, the higher the rate of adaption to the new performance techniques and vice versa. Global assessments constitute of the repeated application of the knowledge attained from task assessment hence making it a routine. Once the knowledge is applied, the management interprets the results through carrying out an evaluation of the employees. After the evaluation and analysis of the results, the management takes measures to improve the employee working environment to improve efficiency in the production process. Cicolini, Comparcini and Simonetti (2014) assert that the Altizer model states that the importance of empowerment cannot be underestimated hence; all companies should embrace employee empowerment. The model consists of four major steps that define the empowerment process. Step one is the reviewing of the employee authority and the model holds that, as long as the employees are trained to carry out various tasks, they can be entrusted with various management tasks. The empowerment enables the employees to develop their trust and improve their relationship with the clients. According to Daily, Bishop and Massoud (2012) the second stage involves the delegation process and the Altizer model states that the management team should only avail the necessary resources to the employee and allow them to make their decisions on the factors affecting them. The managers should also encourage the employees to voice their opinions in other aspects of the organization. The move encourages the employees to develop self-confidence and to feel like part of the organization team. The third stage involves the actions of the empowering team to encourage employee innovation. It is the role of the management team to loosen the rules and regulations in the organization to increase the freedom of employees in coming up with innovative ideas. The fourth stage involves the process of recognizing and rewarding the employees who exhibit empowerment in their actions. The rewarding encourages the other employees to strive to incorporate positive change within the organization during the empowerment process. As noted by Ebers and Maurer (2014) the Thomas and Tymon model improves the Thomas and Velthouse model which is based on the task assessments. 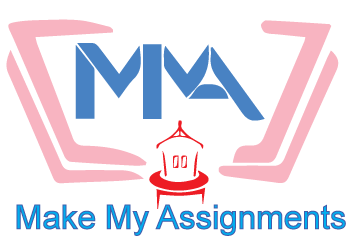 The two models are almost similar to each other, but the definition of the task assessments vary slightly and the impact assessment in Thomas and Velthouse model is replaced by the progress assessment in the Thomas and Tymon model. According to Thomas and Tymon, the task assessments are described as follows; progress refers to the feeling of fulfillment an employee receives after accomplishing their tasks. Choice refers to the independence feeling of an employee to select and perform an activity in the way he or she deems right. Fernandez and Moldogaziev (2012) note that meaningfulness refers to the employees feeling that the energy they devote on performing the tasks is worthy their struggle. It is the feeling that the employees are involved in activities that are of great value to them. Competence refers to the feeling achieved after performing their tasks with expertise. According to the Thomas and Tymon model the task assessments result in a different sense of feelings. These feelings are divided into self-empowerment feelings and team empowerment feelings. The self-empowerment feelings result from choice and meaningfulness assessments while team empowerment feelings result from competence and progress assessments. Fernandez and Moldogaziev (2013) point out that the Spreitzer shows that psychological empowerment is the backbone of improved performance and increased productivity in the organizations. The model supports the four dimensions in the Thomas and Velthouse model and relates them to self-determination. Spreitzer further argued that meaning, impact, competence and choice combine to result to psychological empowerment. In the model, Spreitzer explains that once an employee is physically empowered, he or she gains high self-esteem which pushes him or her to embrace innovativeness and effectiveness during the performance. Since the empowerment enhances the accessibility of the company's information to the employees, they can work towards achieving the company's mission and vision. The reliability and validity of findings from a study are dependent on the methodology that is adopted during the study. Therefore, it is crucial for the researcher to close attention to the methodology that is an adopted in a particular study failure to which the purpose of the study will not be realized. The objectives of a particular research topic determine whether the research methodology is appropriate or not. In other words, the methodology must go hand in hand with the study objectives. The aim of this study was to assess how nurse empowerment can enhance the efficiency at Mater Hospital. 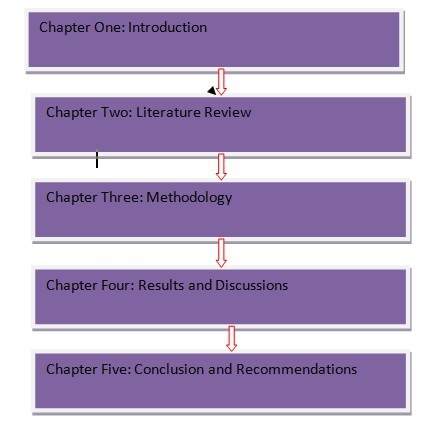 The methodology chapter discusses the methodology that was applied to achieve the objectives of the research. Section 3.1 provides an overview of the methodology and the overall structure of the third chapter. The process of formulating hypotheses and the hypotheses that were formulated before the study are provided section 3.2. Section 3.3 outlines the research questions that drove the study. The Research Philosophy is provided in section 3.4 whereas the Research Approach is provided in section 3.5. Section 3.6 discusses the Research Strategy whereas section 3.7 discusses the Research Design. The Methods of Data Collection are provided in section 3.8, and section 3.9 describes the data. Finally, Section 3.10 discusses the method that was used in Data Analysis. Research hypotheses refer to the statements that speculate on the results that are likely to be found after a study. The existing literature on the topic of study plays an instrumental role in the formulation of the hypotheses (King 2013). Therefore, the research hypotheses are instrumental in the realization of the objectives of the study. The research hypotheses add meaning to a study because they offer guidelines to the researcher about the assertions to be disputed or supported by the study findings (King 2013). Research hypotheses were used during the study to offer a sense f direction to the researcher during the study. Since the hypotheses were clear, the researcher did not deviate from the objectives of the research. The activities that were conducted during the study revolved around the hypotheses. Accordingly, the hypotheses simplified the entire process of the study. The data that was collected during the study was aligned to the hypotheses in a bid to support or dispute the hypotheses. More importantly, the hypotheses supported the case for empowering nurses at Mater Hospital. The clarity of the study findings was fostered by the research hypotheses because the hypotheses gave an indication f the outcomes that were expected from the study. The researcher formulated three hypotheses using existing literature and the hypotheses are outlined below. Research questions help in the realization of the research objectives (Tarone, Gass and Cohen 2013). In other words, the research questions guide the researcher on how to go about the process of gathering and analyzing data. The research questions should be in agreement with the research objectives for them to be relevant in a study (Tarone, Gass and Cohen 2013). The research questions that were used in this study were drawn from the objectives of the study and they are outlined below. What is the rationale for nurse empowerment? Is it economically feasible to empower nurses? What are the perspectives of nurses regarding the concept of empowerment? Is the concept of nurse empowerment justifiable in the healthcare setting? How does empowerment increase the effectiveness and efficiency of the nurses? What are the attitudes of healthcare managers towards the concept of nurse empowerment? The philosophy applied during research guides the researcher on how to select the most suitable methods of collecting and analysing data. Subsequently, the research philosophy adds value to the findings of a study (O'Leary 2013). The main characteristics of a research paradigm include axiology, ontology and epistemology. Under ontology, the nature of an issue is viewed depending on its reality and all assumptions. Under epistemology, the views of a researcher have based the comprehension of nature. In axiology the views of a researcher are based on the relationship between the assumptions of acceptable knowledge and what a researcher is aware of. 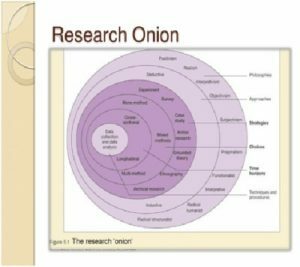 The research onion provided in the figure that follows offers a detailed view of the philosophical approaches that offered guidance on choosing the relevant methodologies for gathering data and analysing it. 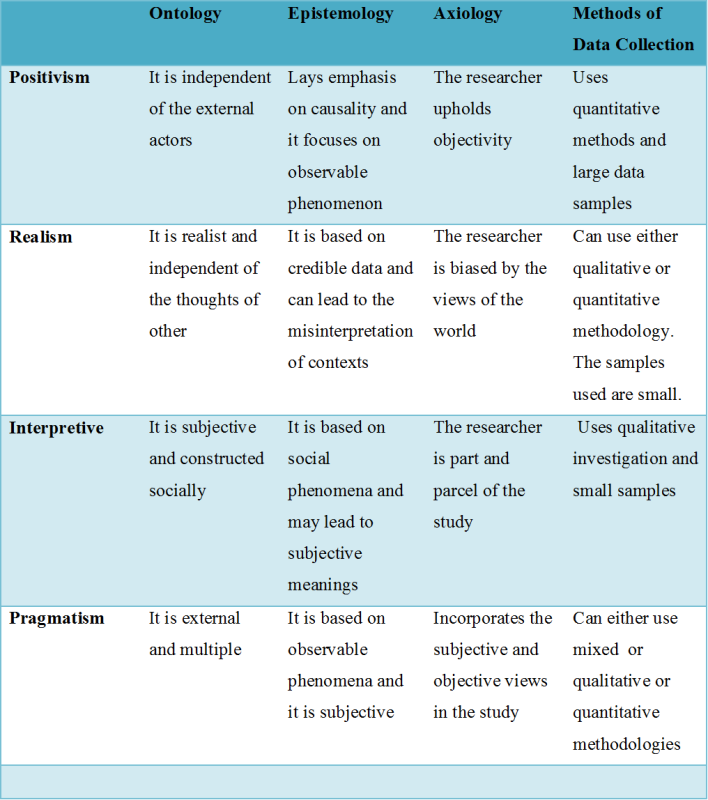 The main pillars of a research philosophy include pragmatism, positivism, realism and interpretive. A comparison of the philosophical approaches is provided in the figure. The motives of a study influence the research philosophy that is adopted. This research aimed at assessing how empowerment of nurses can be used to enhance efficiency at Mater Hospital. The observable facts that were considered in this study include the participation and involvement of nurses at Mater Hospital. Ordinal numbers of a Likert-In scale were used in measuring the observable facts. Microsoft Excel was used to analyse the data. The mean and standard deviation of the variables were generated using Microsoft Excel. The number of nurses that was included in the sample was big and this reduced biases regarding the empowerment of nurses at Mater Hospital. Furthermore, empirical methods were used to test the findings of the research and this increased the reliability of the results further. The positivist philosophy was the most suitable research because the philosophy allowed the empirical testing of the research findings. Furthermore, the research philosophy allowed the collection of data from a large sample and this fostered the accuracy of the study findings. More importantly, the philosophy played a crucial role in establishing the cause and effect relationship between nurse empowerment and effectiveness at Mater Hospital. In addition to that, the philosophy enabled the researcher to analyse the data suing descriptive statistics and this simplified the process of data analysis. Therefore, the study needed a methodology that is highly structured thus the best option was positivism and not pragmatism, realism and interpretive because they do not lead to the application of strict methods. As shown in the comparison of the philosophies the other philosophies would have compromised the accuracy and reliability of the study findings because they are subjective. The first research approach that can be used in a study is known as the Quantitative approach whereas the second approach is known as the qualitative approach. It is significant for a researcher to comprehend the research approaches because it aids in selecting an approach that is appropriate to a particular study (Choy 2014). The research approach must be in agreement with the philosophy that is updated in a particular study. The quantitative approach goes hand in hand with the positivist paradigm since it applies deductive reasoning (Choy 2014). The data obtained using the quantitative approach is translated to the numerical form and this makes it easy to use the statistical techniques to analyse the data. Additionally, hypotheses are formulated under the quantitative methodology and they help in predicting the results that are expected from a particular study. Statistical techniques are used to analyse the data obtained using the quantitative approach. The strategy of research is also a crucial element because it plays a part in the success of a study. The research strategy must be in agreement with the research approach and the research philosophy (King 2013). The strategies that can be applied in a study include case studies, surveys, and experiments. Experiments identify the link that exists between the dependent and independent variables and they are applied in the exploratory studies. The survey strategy is applied in studies that require large data samples (King 2013). Questionnaires are used as the instruments of collecting data are surveys. The case studies are applied in the traditional science research. The survey strategy was used because the data sample included a large number of nurses from the Mater Hospital. Since the case study strategy is applied in the traditional sciences, it was not suitable for this study. In the same way, the experimental strategy was not fit for this study because it is mostly used in the experimental strategy. The research designs that can be adopted in a study include the causal, descriptive and exploratory studies and it depends on the requirements or objectives of the study (Tarone, Gass and Cohen 2013). It is significant for the research to comprehend and differentiate the various research designs because it contributes to the realization of the study objectives. The research design that is used in a study should not contradict the philosophy, strategy and approach applied in a study (Tarone, Gass and Cohen 2013). As discussed above, this study used the quantitative approach, the survey strategy and the positivism philosophy. Accordingly, the most suitable design for this study was the descriptive design because it was aligned with the objectives of the study. In addition to that, the descriptive design goes hand in hand with the positivism philosophy that was chosen for the study. Markedly, the causal and exploratory research designs were not fit for this research because they are applied in the interpretive approaches and they are linked to social constructs. Applying the causal and exploratory designs would have made it hard to get data from a big sample. Moreover, it would have made it hard to use statistical techniques when analysing data. The methodologies applied when collecting data during a study dictate the success of a study hence it is essential to weigh the advantages and disadvantages of each method before selecting the best methodology (O'Leary 2013). The findings from a study can be misleading if the methods used to collect the data are inappropriate. There are two main categories of the methods that can be used to collect data in a study and they include the secondary methodologies and the primary methodologies. Secondary data is available in the published materials and it offers information about the studies that have been carried out by researchers in the same field. The online sources and public libraries offer reliable secondary data. The data is contained in articles, published books, journals, newspaper and periodicals. Additionally, the secondary data can be obtained in the form of soft copies. The usage of secondary data is advantageous because it can be obtained easily thus it saves the researcher the time that would have been sent in getting the data from scratch. The collection of secondary data does not require detailed and complicated procedures. More importantly, the usage of secondary data is less tedious when compared to the primary sources. Nevertheless, there are limitations in the usage of secondary data and the first one is that it may be hard to obtain the relevant data regarding specific topics using the secondary sources. Secondary data may make it hard to realize the research objectives due to its inadequacy. Furthermore, the findings of a study may be jeopardised due to the use of outdated secondary data (O'Leary 2013). Comparatively, primary data is obtained by the researcher from the field directly. The primary data may be quantitative or qualitative and it is all dependent on the requirements of a study. The methods used to collect the primary data encompass observation, interviews and questionnaires. This study used a questionnaire to collect data from the nurses that work at Mater Hospital. The online questionnaires were suitable because they helped in getting from a large number of nurses and this include the nurses that work part-time and those that work fulltime. Since the researcher wanted to gather quantitative data the observations and interviews would not be appropriate during the study. The quantitative data was translated into a numerical format and this simplified the process of analysing it statistically. The use of the online questionnaires was convenient because the questionnaires were adjusted easily when the need arose. Also, the questionnaires reached a large number of nurses within a short duration. The questions that were used in the questionnaire were closed ended thus they standardised data and helped a great deal in analysing the data using statistical techniques. All in all the usage of questionnaires played an instrumental role in the realization of the study objectives. The study focused on nurses that work at Mater Misericordie Hospital. The Mater Misericordie University Hospital is a teaching hospital that is based on the Eccless Street in Dublin Ireland. The hospital neighbours Children's Hospital and it has offered public hospital care to the adult patients for the past 150 years. The Sisters of Mercy established the hospital to run as a voluntary Roman Catholic hospital in Ireland. The hospital has links with the University College Dublin School of Medicine and it offers national tertiary care in the medicine branches. The hospital is a tertiary referral centre that deals with cardiothoracic surgery and the National spinal injuries section. The lung and heart transplant programmes are hosed at the hospital. The hospital offers 24 hours cardiology services and heart valve replacements. Furthermore, ophthalmology and dermatology services are offered at the hospital. Other services that are offered at the hospital include diabetology, nephrology, endocrinology, neurology and respiratory medicine. Both the part-time and the full-time nurses at the hospital were included in the sample. Furthermore, the managers in the nursing department were also requested to feel the questionnaires, and this helped in capturing the managerial perspectives regarding the empowerment of nurses at the hospital. The participants were chosen using the simple random sampling method. 3.10 Data Analysis Data analysis refers to the application of logical and statistical tools to analyse the data collected from the field in a bid to draw conclusions that are relevant. The data analysis process condenses recaps and evaluates data with the intention of drawing conclusions that are valid. 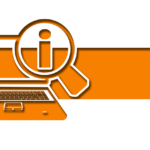 The data analysis process relies on the philosophy of a research and the requirements of a study. It is important for the researcher to apply he required skills when performing the data analysis failure to which the whole process of data analysis will be flawed. The possession of appropriate skills simplifies the process of data analysis. More importantly, the appropriate skills make it easy to select the most suitable method of analysing the data. The acceptable norms and research ethics must be followed when conducting the data analysis. The requirements of a study dictate the methodology that is used to conduct the analysis. This study used the quantitative approach and data was obtained using the questionnaires. The responses from the participants were ranked using the five Likert-in scale. Descriptive statistics were used to analyse the data. Specifically, the measure of dispersion that was applied during the analysis is the mean. The descriptive statistics offered meaningful results and more importantly, they increased the reliability of the results. The process of data analysis focuses on the condensation and evaluation of the data with the aim of drawing conclusions. In this research, descriptive statistics were used to conduct the data analysis and they played a central role in the drawing of conclusions. The aim of this study was to establish How Nurse Empowerment can enhance efficiency in the healthcare setting. The hypotheses that were formulated using the literature review were tested in a bid to show the relationship that exists between nurse empowerment and efficiency. Section one of this chapter offers an overview of the whole chapter. Section two provides the detailed profile of the respondents that took part in the study. The profile describes the education level, management level, income level, gender, age and marital status of the participants. The third section of the chapter offers the main findings of the study. In addition to that, the hypotheses of the study tested in the third section as well. The participants that were included from the sample were drawn from Mater Misericordie Hospital. The nurses included the nurses at the Top, Middle and low management levels and this helped the researcher the get the perspective that nurses at various management levels have towards the concept of empowerment. The total number of nurses that were included in the sample was 50. The 50 nurses filled the online questionnaire were analyzed in a bid to draw the relevant conclusions on the concept of nurse empowerment. All the nurses filled are returned the questionnaires after the duration of two weeks. Therefore, the response rate for this study was 100%. The nurses were requested to fill the questionnaires voluntarily and this implies that they gave honest and sincere responses. Individuals from various age groups took part in the study; thus, the researcher categorized the respondents into various age groups. The number of respondents aged between 20 and 30 was 18.The number of individuals aged between 31 and 45 was 20. The number of participants that were aged between 46 and 60 were 10.The participants that were aged more than 60 were two. A breakdown of the participants' age profile is provided in the table and figure that follow. The table indicated that the sample represented individuals from various age groups. 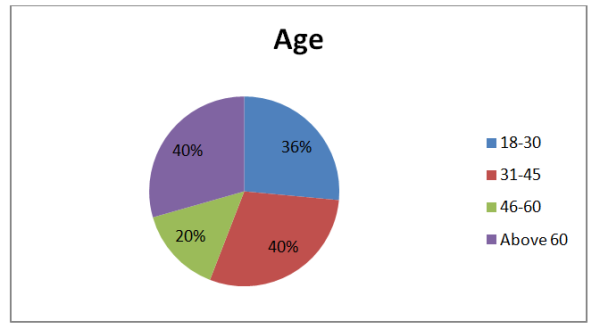 Figure 4: Age Groups of the participants. Concerning marital status, individuals that were married, single and divorced participated in the study. The number of the married individuals was 25 and this represented 50% of the total population. The number of single participants was 20 and this represented 40% of the total population. The number of divorced participants in the study was 5 and this represented 10% of the total population. The statistics concerning the marital statuses of the participants are provided in the following table and figure. The participants had various educational qualifications hence it was crucial for the researcher to categorize them according to their level of education. The number of participants that had reached the high school level of education was 5.The number of participants that had attained the diploma level of education was 20.The participants that had attained he University level of education were 25. The breakdown of the participants' level of education is offered the table and figure that follow. The study was to ascertain whether nurse empowerment can be used to enhance effectiveness in the context of Mater Misericordie Hospital. As mentioned earlier, the responses were obtained using an online questionnaire. The responses that were given by the participants were ranked using a Likert scale. According to the Likert Scale 1 stood for strongly disagree, 2 indicated disagree, 3 indicated neutral, 4 indicated agree and 5 indicated strongly agree. The researcher used a measure of dispersion to conduct an analysis of the responses. The mean and the standard deviation were computed for each response in a bid to test the hypotheses of the study. In the context of this study a mean score of 3.0 implies that the participants neither agreed nor disagreed with the assertions of the particular question. Besides, a mean score of more than 3.0 implies that the participants agreed with the assertions of a particular question. A mean of less than 3.0 implied that the participants did not agree with the assertions of the particular question. N which is the sample size is 50. The maximum mean for each question in the questionnaire is 5.00 whereas the minimum mean score for each question is 3.00.